Last year, Josh Hoey ran to the record books. After setting the indoor national record in the 800 meters, Hoey had an impressive outdoor campaign that saw him go 1:48.07 at the IAAF U20 Championships in Finland, breaking the state record. Fast forward to this season and it's a new crop of talented half milers -- not quite on Josh Hoey's level -- but strong nonetheless. The top returner based on time is none other than Josh's little brother Jonah Hoey, now a junior at Bishop Shanahan. Hoey went 1:52.59 at the post-state John Hay meet at Henderson. 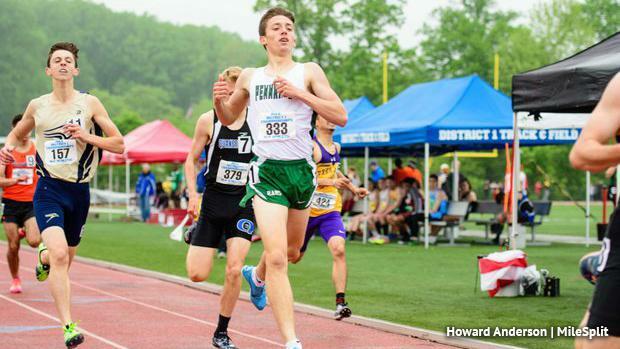 He went after the 1600 at states, but he may look to the 800 this season. Pennridge's Matt Eissler also went sub-1:53 last spring, going 1:52.96 at Henderson. Eissler took a fall at indoor states, which cost him a shot at the win, so he'll be motivated this spring. Then there's the indoor 800 meter state champion, Tyler Shue of Ephrata. The junior overcame a fall in the mile to win the 800 title at PSU. He was second in AAA at states last year (the top returner in AAA based on states finish). He went 1:53.88 in that state final and will likely go even faster this season. Radnor's Ethan Zeh (sixth) and Council Rock South's Collin Ochs (seventh) are also among the AAA state medalists back this season (also indoor medalists from this winter) and they'll be factors again this season. Central Bucks East's David Endres (second at indoor states; 1:54.05 best from the winter) will be in the mix, too, along with third place indoor states finisher Seth Ketler of Seneca Valley (1:55.23 best from last spring). Warwick's Connor Shields, Cedar Cliff's Jack Baker, Mifflin County's Seth Phillips, and Highlands' CJ Thimons also have sub-1:56 times to their name from last outdoors in AAA. As for AA, there are two returners who went under 1:56 last spring: Juniata's Garrett Baublitz and Grove City's Jonah Powell. However, both focused on the 1600 at the state meet. Either could be a factor if they go after the 8 this season (Powell doubled back in the 800 at indoor states and took fifth). The returning AA medalists from a year ago are Seneca's Jake Schneider (fifth), Mid Valley's Sebastian Brudnicki (seventh), and Deer Lakes' Josh Yourish (eighth). Watch for Jim Thorpe's Samuel Hydro, who went 1:57.05 to win the D11 title last spring.